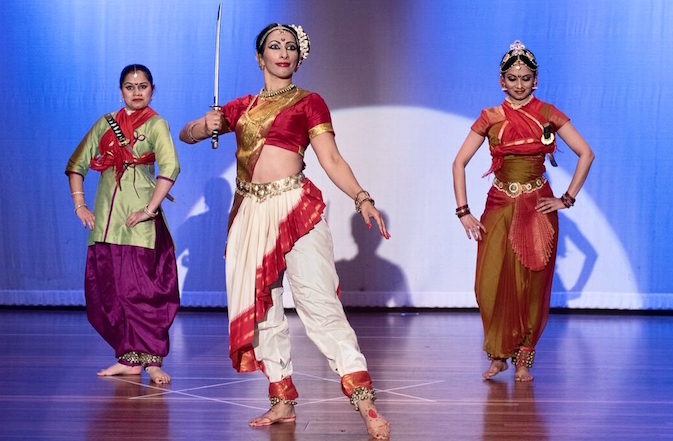 Warrior Princess: Jhansi Ki Rani is a unique production under the artistic direction of Tara Rajkumar OAM, founder and director of the Natya Sudha Dance Company. This event in the leafy grounds of Queen Victoria Gardens brings together four Melbourne-based Indian dance schools (Art of Vinyasa, Natya Sudha, Manmohini Indian Dance School, Prakalpa Samskruti) and five exceptional dancers from these schools who have come together to create choreography based on four varied but complimentary Indian classical dance styles of Bharatanatyam, Mohiniattam, Kathak and Kuchipudi. Join us at MPavilion for this colourful and energetic performance supported by Melbourne Festival, one that explores the depth, breadth and energy of Indian dance. Feeling peckish? The Shiva Indian Cuisine food truck will be at MPavilion serving-up delicious Indian food all afternoon from 12.30pm to 5.00pm. Shiva Indian Cuisine is the creation of Sachin Garg who, inspired by travels to his country of origin, and visiting street hawkers and night markers, decided to bring an authentic Indian experience to the streets of Melbourne.